My little crafty factory has been chugging along quite nicely over the past few weeks getting prepped for all the craft markets I’ll be attending this season. I haven’t had time to properly photograph and write up all of my new wares, so not much is listed in my Etsy shop just yet, but it’s coming. I swear! I love ’em. I’m probably not supposed to say that about my own stuff, but I really really love the way they turned out. It’s been a long time coming; I spent months sourcing good suppliers for raw brass lockets and cameos, learning how to age & patina the brass myself, learning how to (& how NOT to) seal the tiny paintings in resin. Phew! It was well worth it, methinks. 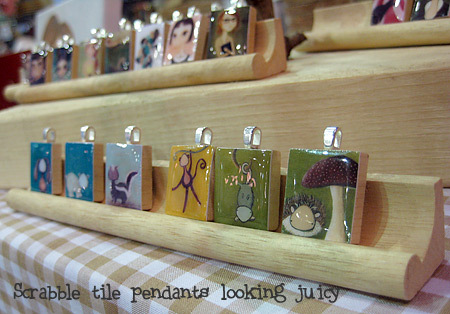 I still like my Scrabble tile pendants too – they’re light & cute & fun, but it’s nice to have a dressier option. 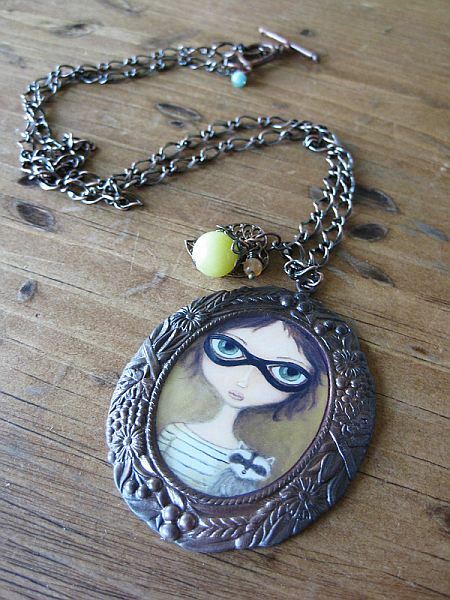 I like to wear my own jewelry when I’m out at art functions so I can explain what it is I do more easily. 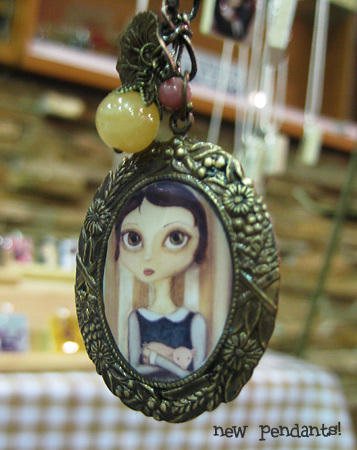 I hate stammering about how, “I paint girls with a, um…storybook sort of feel?” Blank stare. 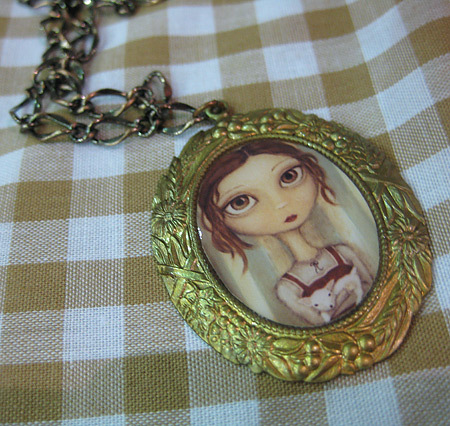 Much easier to just say, “I paint cute portraits – like this!” Then point to my necklace. 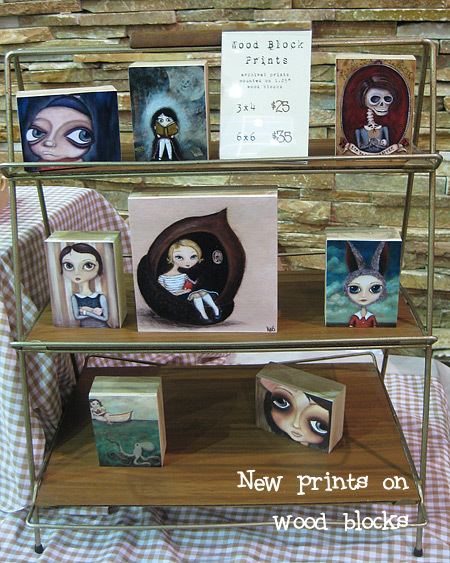 One of the other new things I unveiled at my last market is prints on small wood blocks, then coated with a shiny varnish. I think I’d like to try covering them in resin too, since I’m all about the juicy shiny wet look right now. They’re so cute & perfect to just perch on a shelf or window ledge. I think they’d look great hung on the wall in a wonky arrangement too. Fun fun! One strange question…what do you think the stand in the above pic is actually for? I picked it up at a thrift store (though I didn’t think it was particularly thrifty at $5.99, but whatever). How did people originally use this thing? Tea cup displays? Books? I’ve got no clue. The handle on top seems like it’s meant to be moved around, so probably not breakable treasures. I feel like my grandparents may have had something similar sitting beside my grandpa’s easy chair where he hung newspapers off the gold bars…but I could be remembering that completely wrong. Ideas and random guesses welcome! LOVE the bandit mask girl cameo! (I have a thing for little black bandit masks :)) So cool!